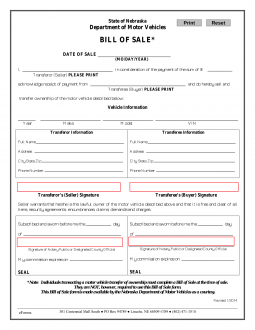 The Nebraska Bill of Sale Forms are legal documents that prove the legal sale and purchase of vehicles, boats, firearms or anything that needs proof of sale or even if the seller and buyer would simply like to have proof of sale and ownership, for their records. These documents will provide information with regard to the seller, buyer, the item(s) being sold and change of ownership. In some cases these documents are required for registration and will require notarization. Boat Bill of Sale – Can be used to provide proof of sale, purchase and change of ownership of a vessel. Firearm Bill of Sale – Provides proof of sale, purchase, and change of ownership of a gun. General Bill of Sale – Generally, this form is utilized between two private parties with regard to the sale and purchase of personal items. Motor Vehicle Bill of Sale – This will document the sale, purchase and prove change of ownership of a motor vehicle. This form is often required for registration. Take a completed Nebraska Concealed Handgun Permit Application to your local state patrol. Since some counties handle applicants differently, you will be guided according to the location in which you visit for applying.